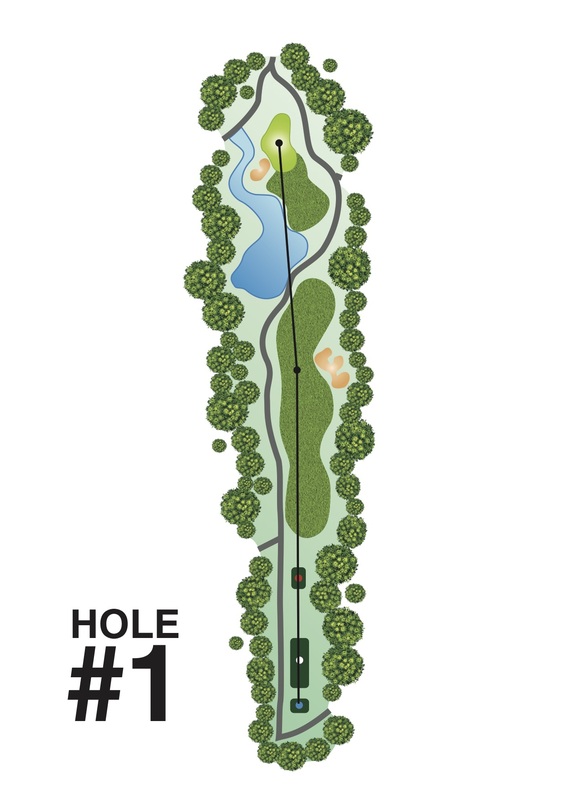 A long and challenging starting hole that should be played with due consideration to ones’ abilities and the fact that it is the start of the round. Large bunker guards the drive target area to the right directing the sensible player to play to the fairway just short of the hazard. With the fairway sloping away to the left and a considerable narrowing in fairway width at the far point of the bunker, the chance of a very long drive ending on the fairway is slight. Following a successful drive, the safe option is to play for the right edge of the green since a slight push will be followed by a relatively easy chip recovery to most pin positions or a slight pull will reach the front section of the green. A direct approach increases the risk of finding the bunker or worse, the pond. The mid-left section of the green is an exceptionally challenging pin position as the slope falls towards the lake and the approach is over a gentle ridge. Even putting to that pin position from elsewhere on the green is likely to end with three putts being required.